So, I guess what I'm asking, and apologies for this being somewhat nebulous, is what on earth is actually going on here? 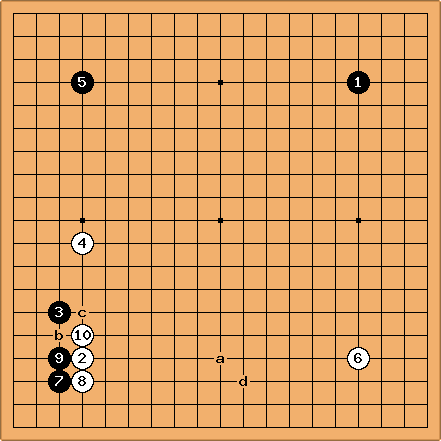 Calvin The position in the first diagram appeared in the final for the 2004 North American Oza in New York, between Feng Yun 9p and John Lee. In Feng Yun's commentary on the game, she said that the early approach of is an asking move, looking for white's response. 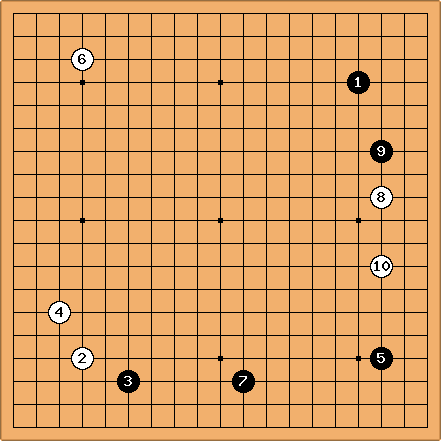 The opening of the game went as in this diagram, and Feng Yun did plan to play the mini-chinese if white responded with the keima as in this game. Bill: I don't know what's going on, but I would be happy to play W 4, here. As White, I would not be unhappy with this line of play. Charles Matthews Bill and Andrew both make reasonable points. This early approach has been played by pros for a decade: White 4 has been tried in 15 different places (! ), and sometimes we get transposition to familiar positions such as mini-chinese, sometimes novel situations arise. 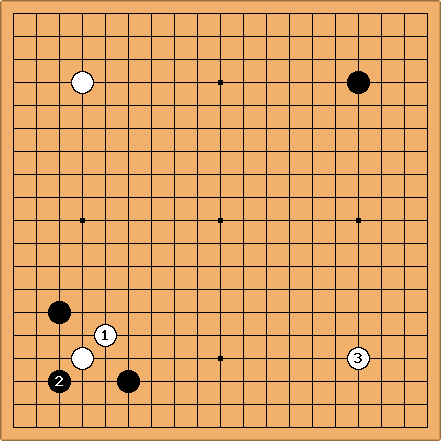 Could just be that the flexibility of the 4-4 point is being invoked before Black plays a 3-4 point which gives the game a more specific character. See Fuseki Not Taking Free Corners for some general comments. dnerra: I find it very hard to tell what is going on in such situations. My impression is that this is not so much a battle about objective advantages, but about trying to get to your favourite fuseki, or avoid the opponent's favourite one. So without knowing what the fuseki-preferences of the players involved, you don't know what they are trying to do. Take for example Bill's diagram above. 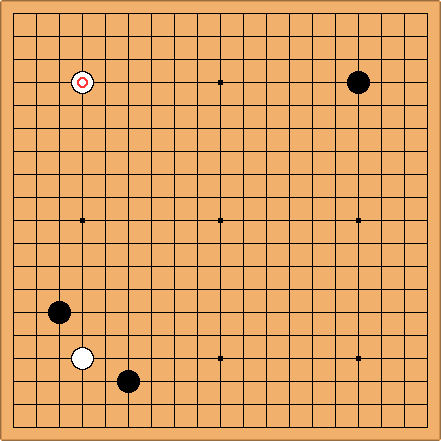 I think he likes it because if Black continues with the natural play at a, he has approached White 4 from the "wrong side". But then again, there are games where this is played voluntarily. Bill: I like it because, if Black plays next in the bottom right corner, White can combine extension with pincer. I do not see what compensation Black gets for allowing that.As White, I would not be unhappy with this line of play. Amusingly, exactly what you Bill said you didn't like is what the pros transposed into: this position is exactly equivalent to a nirensei where Black has chosen not to approach on the open side, with White playing the expected pincer/extension combo. However, with 7, as it turns out, O Rissei got a sensible result along the bottom, to my eyes. No-one ever said this game was simple, I guess! (For what it's worth, after the pincer I'd have taken 6 with my third move as Black, followed (if White took 5) by invading at 3-3. Is this a sensible way of dealing with that hypothetical position? 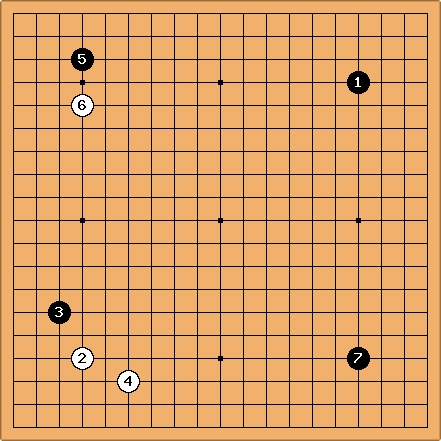 Without a white stone in the vicinity of a, White 8 is usually considered the wrong side to block. 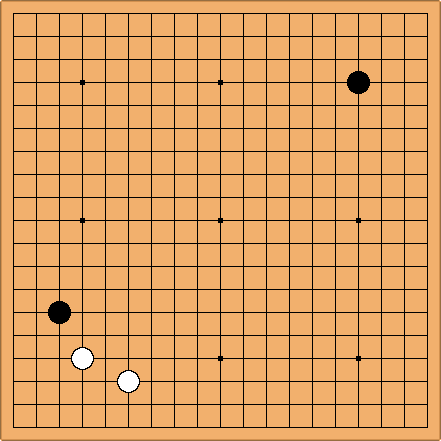 If now Black b, White c, Black d to wedge, White's wall can't work efficiently. 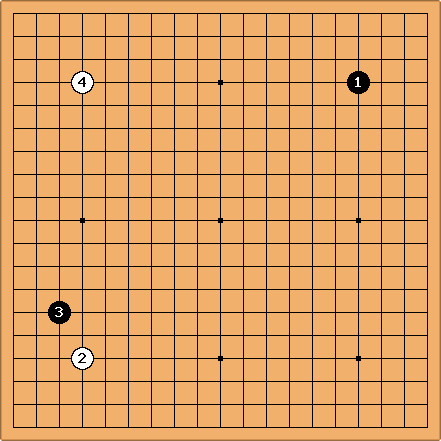 DaveSigaty: I think the first question that arises if White considers playing at the marked point is what happens if Black plays the double approach. Below is the experience for 1990 - July 2002 reported in GoGoD CD. The most usual reply for White 4 is the quiet knight's move. This falls in with Black's original intention but Black does not seem able to produce any advantage from this.